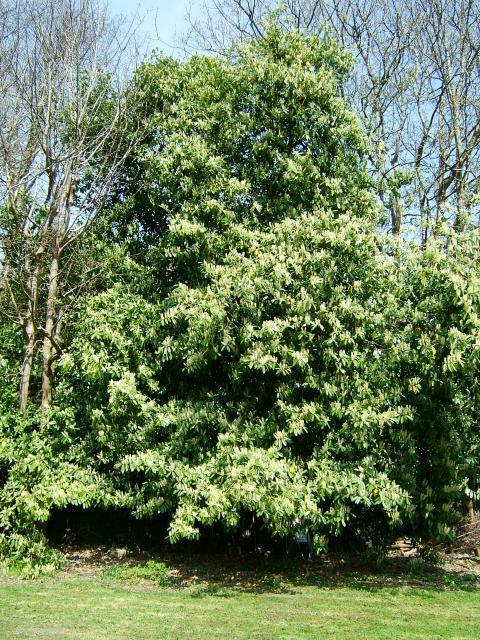 English laurel is native to regions bordering the Black Sea in southwestern Asia and southeastern Europe, from Albania and Bulgaria east through Turkey to the Caucasus Mountains and northern Iran. The common name “English laurel” refers to the similarity of foliage and appearance to the true laurel, Laurus nobilis (Lauraceae). However, the two plants are in different families and are unrelated. It has been under cultivation in Europe as an ornamental garden shrub and as a hedge plant for the past several centuries. It has reached other parts of the world too. It is now planted as an ornamental plant in gardens in temperate regions all over the world. 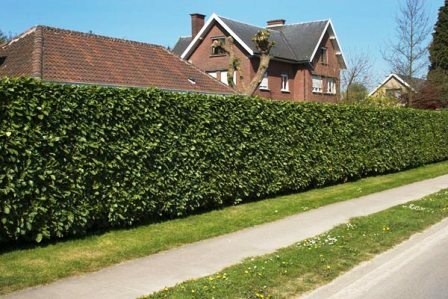 A dense and bushy wide spreading evergreen shrub or small tree; 5 to 15 m tall, trunk upto 60 cm in diameter, spread upto 10 m.
Leaves oblong, shiny 7-15.cm long, 4-10 cm broad, margin finely serrated, leathery, dark green on top and pale underneath. Flowers, cup shaped with 5 petals and are almost a half-inch across, white, fragrant, borne in groups of 30-40 in 7.5 to 15.0 cm long upright racemes. Fruit a cherry like drupe, 1-2 cm wide, dark purple at maturity, edible. The fruits are edible, although rather bland and somewhat astringent. 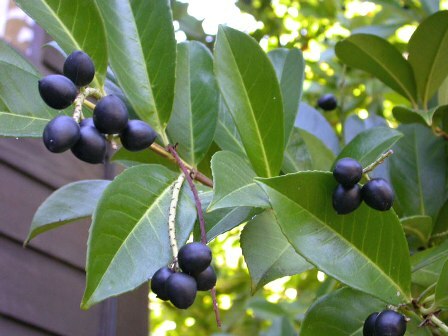 Flavour resembles that of apricots, plums and peaches to which English laurel is related. Laurel water is prepared from this plant by distillation of leaves. This water is used as an almond flavouring. It should only be uses in small quantities as it can be toxic in large amounts. This water is also used for pharmacological purposes. Though English laurel bears edible fruits, but it is not gown for fruits. It is mostly planted in the gardens of Europe and the American West Coast as a specimen shrub. in Europe, the British Isles and on the American West Coast. It is often used in groupings. 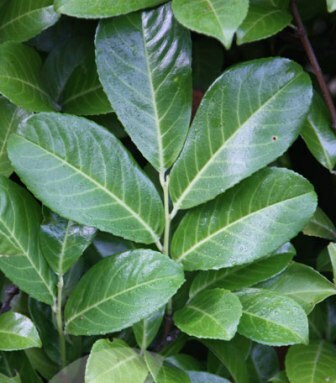 English laurel responds very well to pruning and is therefore widely used as a hedge. It is evergreen and dense enough to make a suitable screen. Fresh leaves of English laurel are reported to be antispasmodic, narcotic and sedative. They are of value in the treatment of coughs, whooping cough, asthma, dyspepsia and indigestion. Externally, a cold infusion of the leaves is used as a wash for eye infections. There are different opinions as to the best time to harvest the leaves, but they should only be used fresh because the active principles are destroyed if the leaves are dried. English laurel is a fast growing shrub under ideal conditions, and if not clipped some of the cultivars will grow to tree stature. 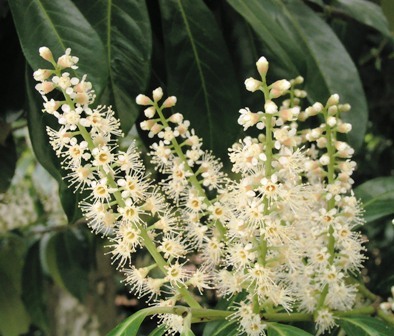 English laurel grows best on a slightly acidic soil. It is quite tolerant to shade but the ideal location will be where the plant gets enough light. It is not droght tolerant and therefore requires frequent watering. New plants can be raised by seed which requires cold stratification for 2-3 months before sowing. The germination is very slow. Plants can also be raised from cuttings and air layering. Seed – requires 2 – 3 months cold stratification and is best sown in a cold frame. Over 40 named varieties are available in the market. But if one is interested in fruits too, then ‘Camelliifolia’ is the best choice. This variety bears huge quantities of fruit which is the size of a large cherry and, when fully ripe, has a reasonable flavour raw with a jelly-like texture and a slight astringency.